How Art Can Help with Self-Regulation? We hear about 21st Century Skills for Learning everywhere in education nowadays. Students should be participating in learning that focuses on the 4Cs: Communication, Critical Thinking, Collaboration, and Creativity. Two out of the four of those require students to have a functional social-emotional intelligence. And rightly so: in a study by Inc. Magazine, 90% of successful people have strong social-emotional skills. However, just like with academics, students come to us with many different levels of social-emotional skills. This is blatantly evident when we throw students into collaborative situations in the classroom. What are we doing as teachers to scaffold these collaborative experiences so that students can learn how to communicate and collaborate? At first, I thought group work might not be working for some of my students because they didn’t have enough experience with it. I figured if I continued to build collaborative activities into my instruction, they would get better at it as time progressed simply from diving in and practicing it. But, like anything else, repeated practice without feedback or instruction doesn’t help someone improve. We wouldn’t repeatedly assess students with the same type math test over and over without providing instruction on the math skills being tested. In the same way, social skills won’t improve without instruction. For this reason, it should be both explicitly taught and embedded into our lesson plans. Help students develop self-regulation. When students are able to self-regulate, they are able to manage their feelings. It comes naturally to some students, and some have great self-regulating adult models at home that have helped students to develop this from an early age. However, many of our students need to learn how to self-regulate. The Zones of Regulation is an approach to help students categorize the way they feel into four zones. Once students identify what zone they are in, they are able to pull from strategies in that zone to help them control their impulses, manage their emotions, and react more successfully when solving conflicts. Through basic instruction on these Zones of Regulation, students learn that is it ok to be in any of the zones, which can be compared to traffic lights (see below). However, optimal learning and collaborating take place when students are in the green zone. This is why students utilize strategies from the other zones- to get them “back to green”. Allowing students to do a periodic “check-in” or reporting of their zone helps students to identify their mood. Once students are able to identify this, they can start matching their current feelings with strategies to help them reach that optimal green zone again. Teachers can provide resources and activities for each zone that students can utilize as needed to independently find their way back to green. Check-ins can also help teacher better identify students that are in need of more social interventions. If a student always checks in as Red, Yellow, or Blue, that can notify us that we need to step in and find out why. Then, we can match that student with the appropriate resources and interventions to help their social-emotional health. We know that until these needs are addressed, students are not able to learn. I wanted to find a way to connect our color-coded check-ins with art. They are colors, so I knew that with a little thought I could find a natural connection to incorporate our zones. This way, the check-in wouldn’t be one more isolated thing, but instead something meaningful and integrated. Around the time my district began this initiative, I stumbled upon an article from MindShift. 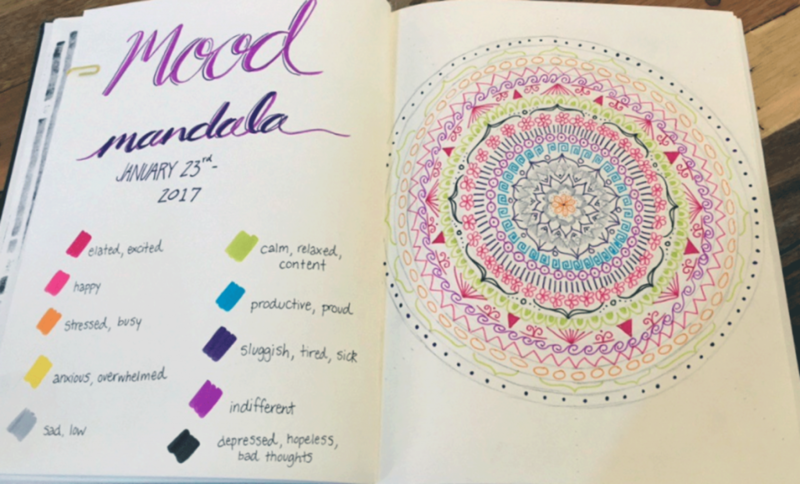 In the article, the author shared how teens were using beautiful, color-coded mandalas to visually represent their mood. (See picture below.) This was all I needed to see to find my connection, I just needed to adjust it for the elementary level. My students already had some initial instruction in each Zone of Regulation, and we had already done some basic check-ins using Google Forms and a dry erase chart with the four colors. I presented my students with a relatively simple mandala with a circular pattern. The idea for us was simple: we would use the basic four colors of the zones. Starting from the center, students colored a circle of the mandala with their current zone at check-in time. With each check-in that followed, students could color a layer, radiating outward until the mandala was complete. At first, these mandalas were just a tool for recording. These had no real connection to arts standards, and there was no art instruction or academic instruction. However, coloring (especially mandalas) is one of the strategies for bringing students back to green, so while it is a check-in tool, it doubles as a calming activity to help students prepare to learn. Once students were competent with the idea of how to check in with the mandala, there are multiple opportunities to integrate visual art. Branch out from the initial four colors. Discuss shades and tints, and how these color variations can mirror variations in moods. Have students create a new color key with color variations within each zone. Now, students have more than just four colors for their mandala, and you have incorporated color families along with vocabulary. Share how the elements of line can be used to create a mandala. Incorporate the idea of rotational symmetry with mandalas. Find resources here: http://splishsplashsplatterart.blogspot.com/2011/02/rotational-symmetry.html. For a ready-made STEAM unit, try connecting music, math and mandalas here. Once students are able to identify their feelings and better regulate them, they will be one step closer to successfully participating in collaborative work. Just like we scaffold and differentiate for academics, we must do the same for collaboration. Designing collaborative activities is not enough. A combination of explicit mini-lessons on how to collaborate successfully and continued embedded instruction will create a culture that naturally supports students’ social-emotional growth. Don’t leave emotional intelligence to chance. If it is that crucial to students’ long-term success, we must make sure to address it through our instruction. In Our Connected World, What if Empathy is Learning? This article has some great ways to build empathy through including it as a self-reflective rubric.